A quick review of a preproduction sample of the Fuji X30. Compact cameras with built-in zooms typically aren’t something I’ve been in the market for, but Fujifilm’s X20 was always interesting to me. I’d handled it in stores, but never had much hands-on time. With the X30 beside me, I can really get a feel for the camera. This review will contain the usual detailed focus on handling, ergonomics, and user experience of the camera, and feature less when it comes to image quality as there are fewer changes there. If you’d like to purchase the X30, or anything else for that matter, please consider using one of the affiliate links below. The price is the same for you, but a small percentage of the purchase price goes to me, which helps keep this site going. Thank you. The X30 has some of the cleanest lines of any Fujifilm X-Series camera to date. I feel like Dieter Rams would approve, especially of the front. It has a very utilitarian look to it with nothing added that doesn’t have to be there. I question the slight slope on the right side as you’re looking at the camera. It doesn’t really seem necessary, and does some weird optical things to the nice straight edge at the very top of the lens. There’s a definite limit to how small a camera like this can get without either sacrificing direct control via knobs, dials, buttons, and switches, or ending up with a camera that feels cramped. Fujifilm have done a great job with their more compact cameras like the X100 and the X30. A lot of people turn to add-ons like cases or thumb grips to compensate for the handling of more compact cameras; I suspect those people are going to want to do so with with the X30. For me, I initially found my thumb falling directly on top of the rear control wheel, which is similar to where my thumb naturally fell on the X100, on top of the rear toggle. Tucking my thumb in the space to the right of any of these cameras feels strange and unstable to me. The single most freeing thing with the handling of these small cameras is to give yourself permission to rest your thumb directly on the LCD when using the viewfinder. That’s it. Worried about smudges? Get yourself an Expert Shield and you can clean your LCD with reckless abandon. The new Control Ring is a fantastic addition, but it’s so close to the body of such a tiny camera that it can make using it to adjust things with the EVF at your eye tough without some hand shimmying or mild discomfort. For making adjustments before you shoot, it’s great. There’s just enough of a rubberized grip to make carrying the camera with a wrist strap very comfortable. 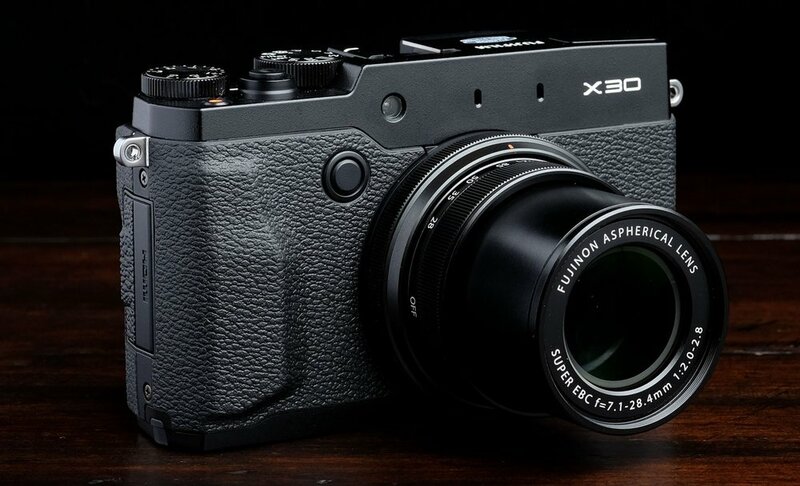 I hope the next X100 moves to this rubberized body as it feel much more sure in the hand. I love it. This camera is small. I’ve heard some say it’s approaching X100 sizes, and at first glance it does seem that way, but once you have it in your hands you can appreciate just how much more compact it is, especially given the zoom range and relatively fast maximum aperture. Compared to an X-E camera with a comparable zoom lens attached, there’s zero contest. Weight favours the X30 as well as you can see below, although the weight is closer to the X100 class than I would have guessed. It’s a very solid, dense-feeling camera. Magnesium does wonders for overall camera feel. A big selling feature of the X30 is the the new Control Ring. We can now make adjustments to our aperture where we’re supposed to, which is really nice. In Manual mode, use the Control Ring to adjust the aperture, and the rear dial to change the shutter speed. This makes perfect sense. When in Aperture Priority mode though, both the Control Ring and the rear dial change the aperture. This could be a little confusing, and is actually undesired for me. I’d love to be able to disable the rear dial when shooting as that way I could rest my thumb on or near it without worrying about changing my aperture. Same thing applies to the X100 cameras. I almost never have interest in fine-tuning my aperture with the rear toggle so it would be great if that could be disabled too. All the buttons on the X30 are suitably and satisfyingly clicky. The only criticism I could possibly level at Fuji on the button front is that wonderful tilt screen protrudes just enough to make a few of the buttons ever so slightly harder to access than they would be without the tilt screen. Worthwhile tradeoff? No question. Nothing to worry about here! It’s as large as they could make it, and it has excellent tactile feedback. It feels very much like an X-E2 D-pad which is a little bit smaller than the X-E1’s. The twist to turn on feature is clever, but this is one of those things I’ll have a hard time getting used to as the owner of multiple Fuji bodies. I always pick up the camera while fondling the shutter release, looking for the power switch. This is a non-issue for folks who only intend to own an X30 of course. A whole section on the cap? Yeah, it’s that good. The X100 caps have never fallen off on me, but it feels like it could. The X30? No chance. When that cap is on there, it’s staying on, and yet it’s still perfectly easy to remove quickly to get the shot. One quick handling note on the EVF, I’ve already brought the camera up to my eye a bunch of times and wondered why I couldn’t see anything. Turns out it’s because the EVF is just far enough away from the left side of the camera compared to X-E bodies and X100’S that it takes a fraction of a second to realign where my eye should go. This is something I’m sure I’ll get used to pretty quick. Outside of that minor handling niggle, the new EVF has got to be one of the X30’s best new features. It’s fantastic. Not quite as sublimely large as the X-T1’s EVF, but damn good. I love that the HUD flips when you switch to portrait orientation. The tilt screen on the X30 is of similar quality to the X-T1. The refresh rate is great, colours seem accurate. Oddly, the display on either camera still doesn’t flip to portrait orientation in the same way that the EVF does. This seems like it should be a fairly simple firmware update. On a camera like this, I can understand the desire for a screen that flips all the way ’round. For those who enjoy selfies, the screen might be a deal breaker. I personally couldn’t care less about selfies, but I do use my cameras in portrait mode. When capturing a pano, or shooting from the hip in the street, it would be nice to tilt the screen up vertically. I tested the X30 in my dimly light basement, and found the results satisfactory. Not mind-blowing like the X-T1, but that’s to be expected for a camera of this class. Place the AF point over something that’s of high contrast and even in really low light, it will acquire focus very quickly. I just had a chance to take the continuous AF for a spin and I have to say I’m impressed. The important thing is to make sure you lock focus on the right object, then the X30 will track it extremely well. I ran a couple of tests at 112mm on people walking towards me while I was walking towards them during rush hour and, provided I acquired focus on the right person, it grabbed hold and rarely let go. The X30 brings some exclusive firmware niceties with it that will hopefully trickle down to at least the last most recent generation of Fuji bodies. I change my auto ISO settings far too often. This is an very welcome addition. Even just having two, a lowlight auto ISO setting and an action auto ISO setting will be really nice. There’s little doubt this feature will filter down. Extra Film Simulation Modes are always welcome. I really appreciate that Fujifilm are apparently quite selective with what they add as far as Film Simulations go. This keeps things from getting to gimmicky or unwieldy. With things like VSCO Cam for iOS, it’s far to easy to become paralyzed by choice. Classic Chrome is a good addition that’s different enough. I could see it taking a place during Film Simulation bracketing. Somewhere between regular 4:3 and the widescreen 16:9 is a magical land called 3:2. This isn’t something I’ve heard a lot of users requesting, and it’s one more size to cycle through when selecting your image size. Not sure it’s a worthy addition, but I suppose this might be just the aspect ratio some people are after. A great feature if your most used setting isn’t in the “Q” Menu by default, or perhaps just isn’t where you’d like it to be. I was really hoping that the adjustment order of “Q” Menu items could be reversed—scrolling right should be plus, not minus based on typical Western conventions—but no luck so far. If you’re constantly changing your AF point and need to do it on the fly as fast as possible, Fuji has you covered. You can now set the D-pad to move the AF point immediately, rather than after tapping the AF button to activate. With this mode enabled, the functions listed on the D-pad are only accessible via drilling down into menu, or configured in your “Q” Menu. Time-lapse fans rejoice! Interval shooting is now fully supported in the X30, just like the X-T1. This is typically the most important aspect of any camera review, but the fact of the matter is there’s not much new to see here. The X30 has the same 12MP ⅔ inch X-Trans CMOS II sensor and EXR Processor II that was found in the X20. I would guess that there will be minor improvements to noise-handling at higher ISO, but don’t expect miracles. Fuji’s interpretation of the Film Simulation Modes appears to be evolving still to as can be seen in my X-E1 vs. X-E2 article towards the bottom. The X30 is an interesting camera. I’m certain that for most of my readers it would be a supplementary shooter that goes with them everywhere or is used for travel. It would also be a good introductory camera for people thinking about getting further into photography than what their smartphone will let them do. It has more than enough manual control that it still captures the experience of photography that is all to often missing from compact cameras. If you’re looking for a nice compact camera with great image quality, a tilt screen, a killer EVF, and a ton of customization, you’ve found it.